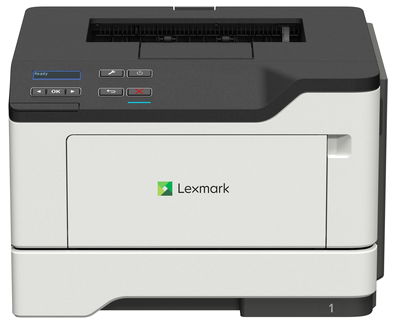 Strike the perfect balance of performance and affordability in small-workgroup mono printing with the up-to 42-page-per-minute* Lexmark MS421dn, featuring standard two-sided printing, enhanced security and built-in durability. Print what you want, in the size you want. The included media tray adjusts to paper sizes from A6 to legal, while the 100-sheet multipurpose feeder accepts smaller media and envelopes to give you even more design and output possibilities. Some laser printers struggle to print grey text that’s easy to read—not the MS420 Series. Its innovative font outlining technology makes even the smallest grey text crisp and clear. Make every watt count with energy management features that reduce power consumption whether the printer is active or in sleep mode. Lower fusing temperature and automatic management of processor cores based on workload help meet rigorous ENERGY STAR 2.0 requirements. That benefits the planet and your budget. All information provided is subject to change without notice. Lexmark is not liable for any errors or omissions. Get mono printing at up to 42 pages per minute, plus standard two-sided printing, at an affordable price. Durability and long-life components keep your maintenance costs low, too. Lexmark's comprehensive approach to product security is a design and engineering mandate across our entire product portfolio. Our security features help keep your information safe—in the document, on the device, over the network, and at all points in between. That’s why Keypoint Intelligence—Buyers Lab honoured Lexmark with a prestigious BLI PaceSetter award for Document Imaging Security***. And this Lexmark product enables you to be GDPR ready. Robust and reliable, Lexmark printers are built to work anywhere from showroom to warehouse with few interventions. Keep going with long-life components and replacement cartridge yields up to 20,000 pages**. Up to 60,000 pages** return program imaging unit. *Average Continuous Cartridge Yield in one-sided (simplex) mode 3,000 standard pages. Declared yield value in accordance with ISO/IEC 19752. **Imaging Unit yield based on 3 average letter/A4-size pages per print job and approximately 5% coverage. Actual Yield may vary based on other factors such as device speed, paper size and feed orientation, toner coverage, tray source, percentage of black-only printing and average print job complexity.